There has been much argument over the age of New Radnor castle. Traditionally it is the successor of Old Radnor castle or Castell Nimble. Tradition in this case is undoubtedly wrong. New Radnor castle was possibly founded as early as the days of William Fitz Osbern in the Herefordshire Marches (1067-71) and it is certain that the Radnor plain to the east of New Radnor castle was considered English land in 1086. This would suggest a castle constructed by this date. Certainly by 1093 the fortress was operational and probably a base for the owning family of Braose in their conquest of the nearby cantref of Buellt. For the first hundred years of its existence Radnor castle seems to have been relatively peaceful. The castle's lord, Philip Braose (1060-1138), was certainly here before setting off on Crusade around 1120 and his charter suggests that a vibrant borough was already flourishing beneath the castle walls. In the 1160's however all this changed and the castle was brought under increasing Welsh pressure which reached its zenith in 1182 when the local princes of Elfael seized Radnor castle after the disastrous defeat of William Braose at the battle of Dingestow. In 1188 Prince Einion o'r Porth of Elfael and Prince Rhys ap Gruffydd of Deheubarth met Giraldus Cambrensis and Archbishop Baldwin of Canterbury here when they travelled around Wales preaching the Crusade. In 1195 the Braose family, probably in the form of Matilda St Valery, returned and rebuilt the castle during the general Marcher offensive of that year. The next year Prince Rhys counterattacked and destroyed Radnor, both town and castle. The result was Rhys' decisive victory at the battle of Radnor. Rhys died the next year, 1197, of the plague and by 1200 William Braose was back at Radnor and receiving encouragement from King John to capture what he could of Welsh territory from his base at Radnor. However, after the Braose rebellion of 1208 John seized the castle for the Crown, only to lose it Bishop Giles Braose in 1215. In 1216 John struck back and Radnor castle was again destroyed. After the death of King John, Reginald Braose rebuilt Radnor castle. It was destroyed again by Prince Llywelyn ab Iorwerth in 1231. Two years later Earl Richard of Cornwall rebuilt the fortress at his own cost and in the 1240's it passed to Ralph Mortimer of Wigmore to guard for his son and heir, Roger Mortimer, who had married the Braose heiress, Matilda. In 1264 Prince Llywelyn ap Gruffydd allied with the sons of Earl Simon Montfort of Leicester and sacked Radnor castle. Once more the castle was rebuilt, though this proved to be its final destruction in battle. In all the castle had changed hands twelve times in only eighty years! On four of these occasions the castle was 'destroyed'. New Radnor is obviously the most unlucky castle in Wales! In maturity the castle proved much more sedate. It was defended against Owain Glyndwr, but the story of the castle's fall and the massacre of the garrison in 1403 is much later legend that has no basis in fact. Radnor castle then gently fell into decay, by 1538 only one tower remained usable and that was used as the county prison. The castle today consists of a great ringwork set on a natural buff overlooking the town of New Radnor. This ringwork was once heavily defended in stone and there appears to be traces of four corner towers and a twin towered gatehouse to the north. This gatehouse was further protected by a double ditch, the outermost cut of which is obviously unfinished and probably dates to the rebuilding of 1233. Beyond this is a large outer ward with foundations of a building which may have been a great hall or stables! Nestling beneath the castle is the town church which was totally rebuilt in the Victorian era. However hidden under the stairs are the effigies of a knight and his lady. The knight holds a round shield and a spear. This is a typically Welsh armourment and the question must be asked, is this the effigy of Prince Einion o'r Porth who held the town from 1182 to 1195? Or his father, Einion Clud who was murdered at Christmas 1177? Probably we shall never know. Order Radnor Castle at £9.95 through the PayPal basket below. 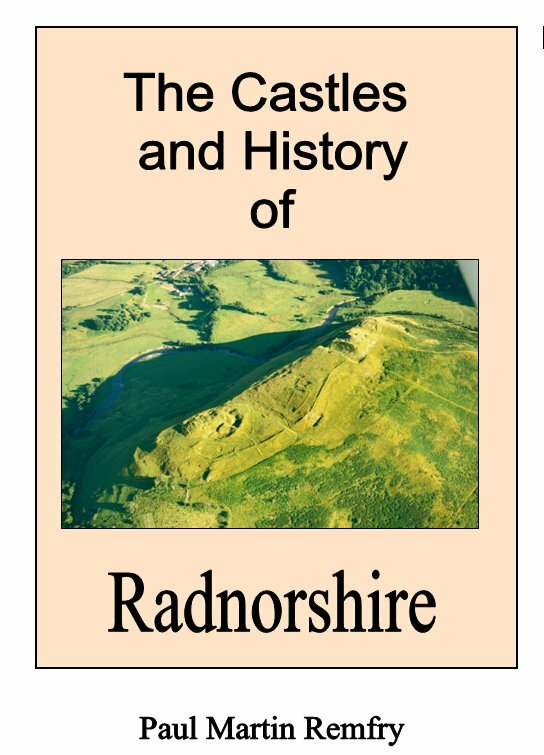 The Castles and History of Radnorshire (ISBN 1-899376-82-8) looks in great detail at New Radnor castle and the surrounding fortresses. The book consists of 309 pages of A4 and examines in greater detail the history and castles of Radnorshire and Rhwng Gwy a Hafren. Starting in the early eleventh century the book covers the age of the castles up to the Civil War of 1642-46. Each castle description is buttressed by numerous photographs and plans of the earthworks and remains where they survive. A new look is also taken at the battlefield of Pilleth and the evidence for the course of the battle is scrutinised. The book also contains genealogical family trees of the major historical Radnorshire families and a full index.